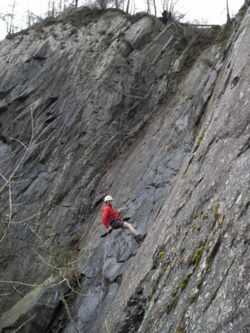 Abseiling is an activity which has its roots in climbing and mountaineering. Abseiling is used as a way to retreat off high alpine climbing routes and is now enjoyed by many as an exciting alternative activity. It is also known as Rappelling from the French word "rappeler" meaning to recall or to pull through. Its nerve wracking and a massive adrenalin rush; a fantastic activity to push your limits! 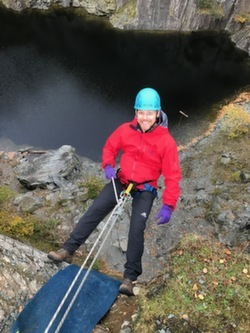 We often use Hodge Close which is a venue close to Coniston and which provides a fantastic location with the most beautiful surroundings, the abseil here is approximately 90 feet in height. instructor holding the safety rope this ensures your safety at all times. If you let go, your instructor has you safe at all times. is an exciting activity, start off small and move up to something more challenging, here are a few videos to see what its all about. 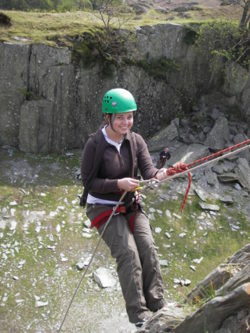 We have many abseiling venues in and around Lancashire and Cumbria in particularly around the North Lake District, South Lake District, East Lake District and the West Lake District areas, for example Coniston, Ambleside, Windermere, Keswick, Hawkshead, Kendal, Bowness, Ullswater and Preston to name just a few. To view some of our abseil pictures please click here Abseil images. can help take the stress out of organizing your charity abseil event , we have a variety of venues or if you have an idea we can complete a risk assessment for you. Click here to go to our sponsored and charity event page. Other terms for abseiling from around the world include,rappelling or rappeling, abbing, jumping, rapping, roping down, roping, seiling, snapling, snappling, snappeling.